My photography started about ten years ago now. It started initially as a way to photograph my cars at the time - another interest of mine. 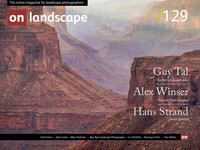 However, soon after, I saw landscape photography as a way of escaping the stresses of work. That last part will resonate with many people, I'm sure. Over the last few years, it has been more important to me than ever. For people that are relatively new to my photography, they may be slightly surprised by my choice for an End Frame article. You see, although my own photographic direction has moved to a more urban documentary style, my original inspiration came from a certain Joe Cornish. It wasn't as if he was one of many landscape photographers that I studied; he was pretty much the only one. I studied and absorbed his photographs relentlessly. The accompanying text that Joe writes within his books was also digested in full too. Although my own personal style and journey have taken me off on tangents from the raw landscape images I was so fascinated by, I look back with most fondness at viewing Joe’s work. After all, breathtaking photography is still breathtaking, no matter the genre. For the people who have had the pleasure to view Joe’s books, you’ll know how difficult it was for me to select a single image. However, I’ve managed to do so… I think!